Popular Halloween costumes for this year will include those characters from Disney’s hit animated movie, Frozen: Princess Anna, her sister Princess Elsa, Kristoff the outdoorsman, Olaf, Sven the reindeer and Hans the handsome royal. 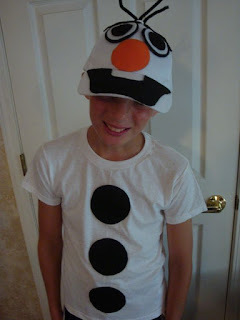 Instead of purchasing the typical and costly Disney costume, be unique and build your own snowman … Olaf! 1. Using the template available here, cut out the pieces and then trace them onto the corresponding colored felt squares. 2. To make the circles perfectly round, one can use objects around the house that are approximately the same size as the circles shown on the template (soup cans, bottoms of drinking glasses, etc). 3. Assemble the eyes as shown using the hot glue gun. 4. 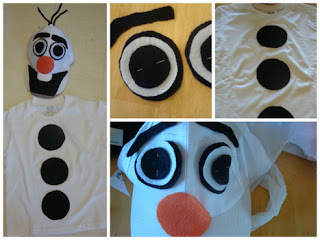 Place the completed eyes, eyebrows on the baseball cap and glue in place. 5. For the nose, use the stencil as a sizing guide. To make a 3 dimensional nose for Olaf, cut a piece of orange felt, roll it into a cone shape and then stuff with polyfil. Attach stuffed nose to top of cap rim using hot glue. 6. Add hair pieces to the top of the cap using the black pipe cleaners available here. Pierce the top of the hat making a hole slightly smaller than the pipe cleaner to push the pipe cleaner through. Allow enough give on the underside of the cap so that the pipe cleaner can be attached and stay in place. 8. For fun, complete the costume using a top hat a trick or treat bag. Have a better idea? Leave it in the comments section below.